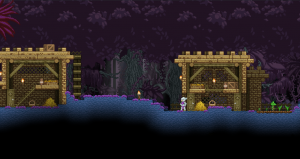 Small dwellings inside an Avian Native Village. Avian Native Village are a friendly Avian themed village made up of traditional small brick homes, with simple nests, baskets and vases. The homes here are made of similar materials as Avian Temples, but the villagers here are friendly. These villages live simple lives, farming and selling wares. Inside most Avian Native villages is a large temple which closely resmbles a hostile Avian Temple dungeon - but is friendly. When searching for clues the temple is where they're commonly found. These dungeons can be found on any planet type aside from moons, any ocean worlds (including magma, arctic, and toxic), or garden planets. They are most likely to appear on jungle planets over any other planet type. Brain Activity Screen Decorative 45 Are those... brain waves? Yes. Yes they are. Carved Bird Console Wire 95 An access panel with a bird crudely etched into the base. Carved Door Door 95 A beautifully carved door. Carved Wall Cabinet Storage 85 Looks like a place you might store an eggcup... Do Avians eat eggs? Crude Pot Breakable 40 This looks like something I made in pottery class. Crude. I should smash it. Crystal Torch Light Source 60 A crystal levitates above its frame, emitting an eerie light. Data Screen Decorative 45 Old system readings that seem to be out of date. Decorative Bird Mask Decorative 55 A rather serious looking bird. Decorative Chest Storage 70 A chest adorned with ancient Avian art. Decorative Human Mask Decorative 55 This guy looks surprised to see me! Decorative Priest Mask Decorative 55 This mask looks like my ex-wife. Decorative Wiseman Mask Decorative 55 This guy seems... wise. Fancy Avian Gong Decorative 105 A big fancy gong. It's covered in carvings. Glyph Screen Decorative 45 Glyphs pulse ominously... what do they mean? Golden Crystal Door Door 95 A heavy golden door with crystals set into its surface. Golden Lamp Decorative 50 A sickly-sweet scent clings to the inside. Golden Urn Breakable 55 The ashes of Avian Stargazers are often stored in urns like this one. Grand Avian Sarcophagus Decorative 100 An expertly crafted Avian sarcophagus. The feather suggests it was for someone important. Guardian's Nest Furniture 105 A solid stone bed topped with a nest of hay. Hay Pile Decorative 70 A pile of hay. Probably not a great hiding place. Human Sarcophagus Decorative 85 Avians have been known to attempt to take human companions with them to the afterlife. Kluex Treasure Map Decorative 350 An old torn map which claims to lead to godly treasures. Kluex Winged Statue Decorative 500 A statue honouring the history of the Avian god Kluex. Kluex World Mural Decorative 550 An ancient mural of the god Kluex. Large Sharp Sticks Trap 90 Sharp, spiky sticks. Don't fall on them. Large Wooden Crate (open) Storage 25 A mysterious wooden crate. Old Pot Breakable 50 A crumbling old pot with patterned markings. It looks smashable. Portcullis Door 95 This heavy iron portcullis opens upwards. Simple Temple Blocks Block 0 Old and poorly crafted blocks, crude drawings are scratched into the stone. Small Clay Pot Breakable 50 A decorative clay pot. Wonder what's inside? Small Sharp Sticks Trap 80 Sharp, spiky sticks. Don't fall on them. Small Temple Bricks Block 0 Dusty but finely crafted bricks. Small Urn Breakable 30 A fragile small urn made from clay. Spaceship Screen Decorative 45 It's a spaceship orbiting a planet. Star Map Screen Decorative 45 A star map! It's a little primitive. Stone Altar Decorative 110 A pale stone altar, undecorated. Stone Worm Statue Decorative 110 A statue of a worm. But where's the hook? Tall Pot Breakable 40 A tall, dusty pot that smells of bird poop. Maybe it's smashable. Temple Block Block 0 Ancient stones with intricate carvings carved into the surface. Temple Bricks Block 0 Small, relatively old bricks with some Avian hieroglyphs carved in. Temple Platform Platform 0 Platforms build from solid temple bricks. Temple Table Furniture 85 A stone table in typical Avian style. Thin Urn Breakable 40 A fragile thin urn made from clay. Torch Light Source 5 This torch flickers softly. Torch Stand Light Source 60 Deep shadows stretch away from this flickering torch. Weathervane Decorative 55 Is that an Avian... or a chicken? Wide Urn Breakable 50 A fragile wide urn made from clay. Wooden Crate (small) Storage 15 A mysterious wooden crate. Wooden Fence Block 0 A sturdy wooden fence. Wooden Stool Furniture 5 A small wooden stool.